Web forms are one of the biggest friction points between users and conversions. Let’s face it, nobody likes filling these things out and shoddy form design is one of the quickest ways to stop people doing business with your brand. The problem is web forms are a necessary evil. They’re the gateway to just about every conversion you need from a marketing perspective. Without them you can’t accept payments, build your email list, sign up new account holders or do much of anything. So it’s vital you’re able to design web forms that convert and today we have seven tools that can help you turn those forms into the kind of money-makers they should be. Form Overview: Shows the number of visitors, how many started filling out your form and how many successfully converted. Field Drop Off Report: See which fields cause users to abandon your forms. Most Corrected Fields: Explore the fields that cause users most frustration. 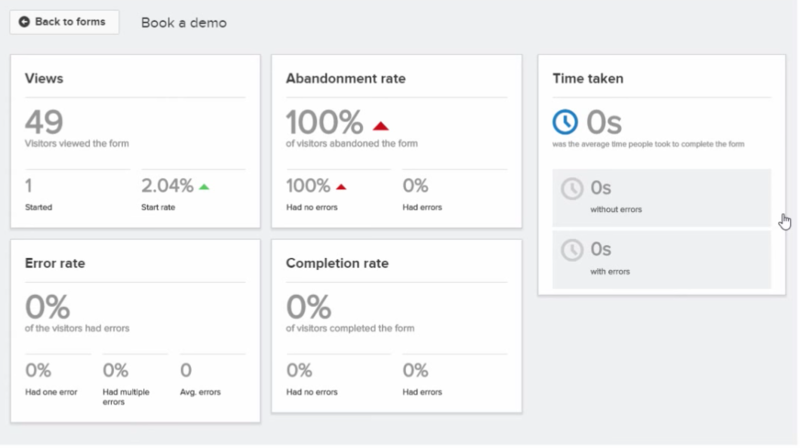 Real Time Report: See how users are interacting with your forms right now. Completion Time: Shows how long it takes people to complete your forms. Problem Fields Report: See which fields are the most problematic. Fields Before Submission: Reveals which fields people complete before submitting and which options cold be removed. Field Times Report: Shows how long it takes users to fill out specific fields. There are four different plans available: Startup, Small Business, Large Business and Enterprise – all of which come with the eight reports as standard, plus various additional features depending on which plan you go for. Either way, you’re getting extensive insights on your web forms, allowing you to test variations and drastically improve your conversion rates. 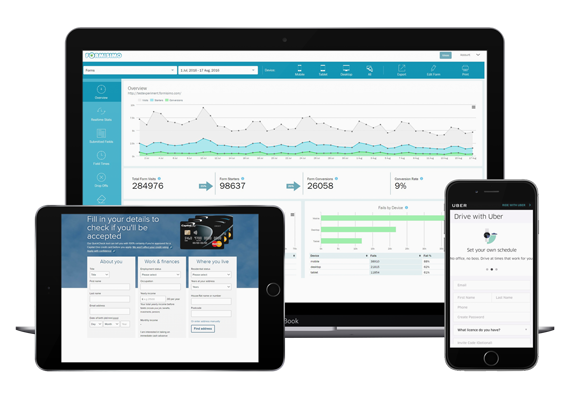 If it’s pure form analytics you’re after, Formisimo is one of the most in-depth reporting tools you’ve got. That said, our other recommendations all offer up more than form analytics reporting – so let’s move on. 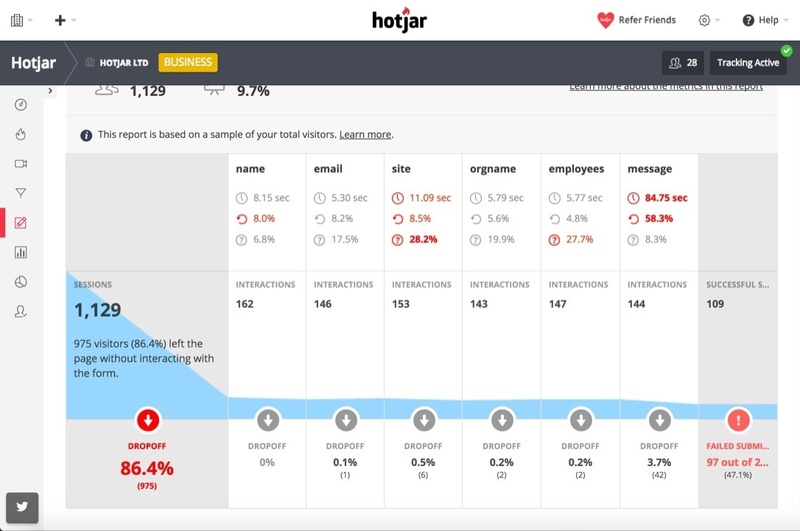 Hotjar aims to be a single analytics toolkit, providing detailed reports on user behaviour. 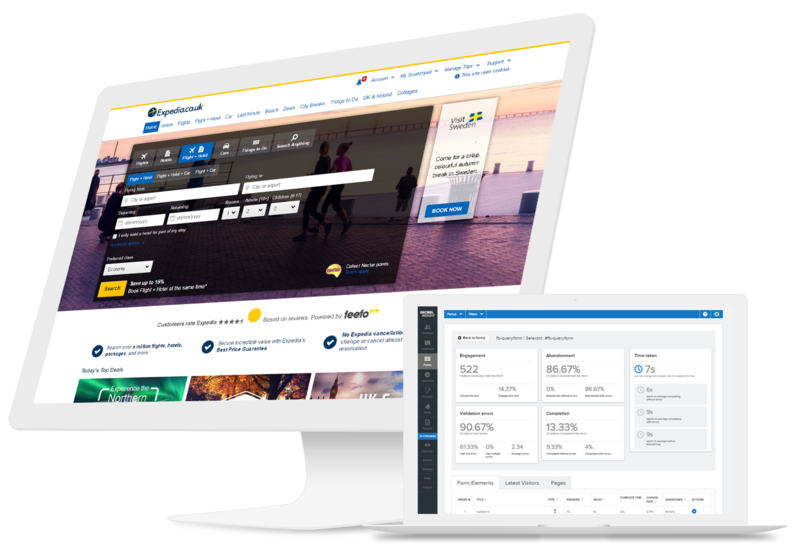 This includes form analysis but also provides heatmap reports, visitor recording (see what your users see), conversion funnel reports and various other data sets. On the form analysis side of things, you can see how many people start your forms, how long it takes them to fill each field and the time it takes to complete the whole thing. You can also see which fields cause users to abandon and how many failed submissions you get. The reports aren’t as detailed as Formisimo but they’re very well put together visually. A quick glance is all it takes to get a solid overview of how your forms are doing and you get a lot more than form analytics as part of the package. Think of this as a Jack of all trades analytics platform – one that includes a competent tool for gaining insights into form performance – rather than a form specialist like Formisimo. As for pricing, packages are based on the number of visitors you want to collect data from, as opposed to features. So you’ll be paying more for Hotjar than Formisimo for large volumes of traffic but you’re getting more reports for your money. 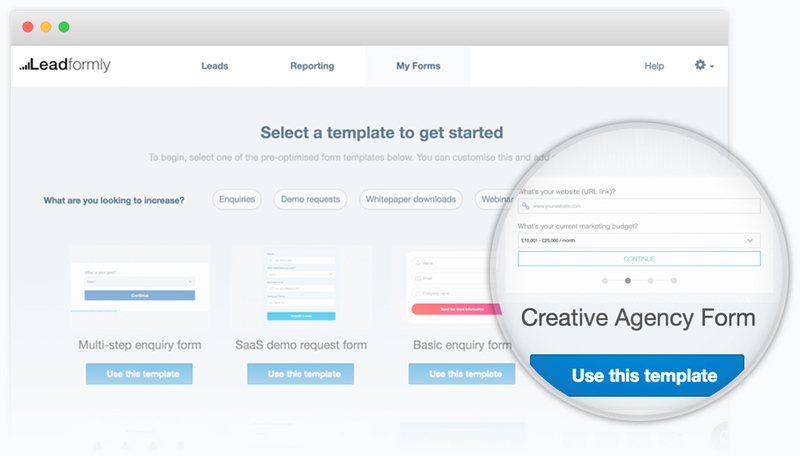 Leadformly is a completely different kind of tool for creating better web forms. 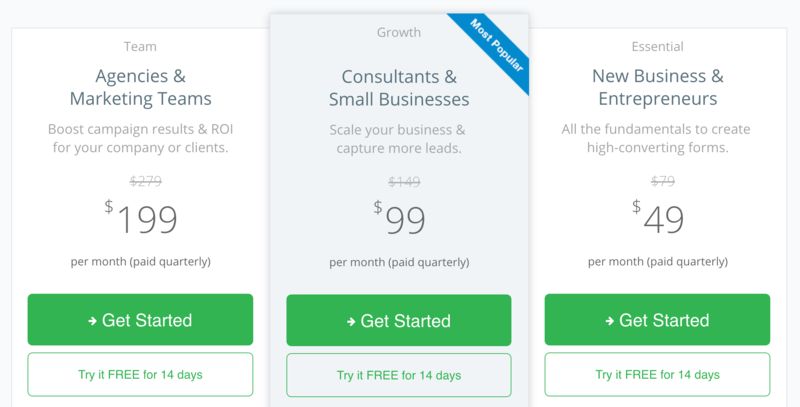 Instead of simply providing analytics, Leadformly gets you started with a range of form templates designed by conversion experts to get results from day one. So, instead of sitting there and watching your web forms underperform, you can get off to a better start from the get-go. 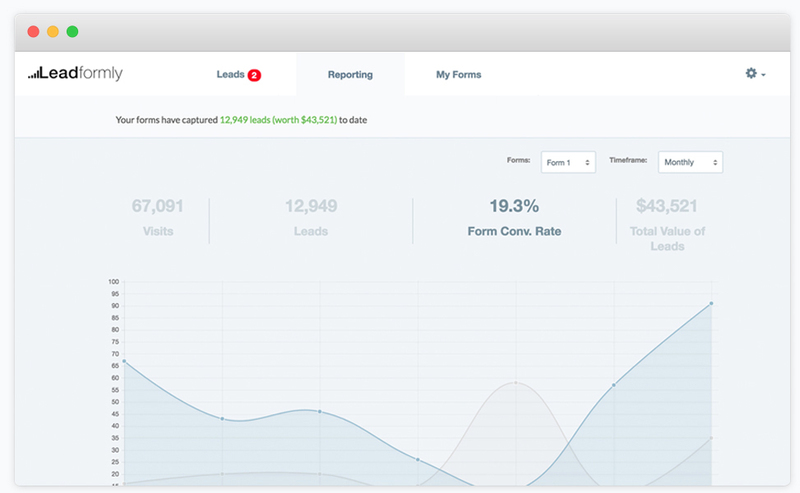 Form analytics is still very much a part of Leadformly, providing detailed insights into how your forms are doing. You’ll also soon be able to run A/B tests on the platform, once the feature rolls out (coming soon), which is really exciting. And, perhaps best of all, you don’t need any coding skills to embed or edit your forms – so you can make improvements on the fly, as and when your analytics/tests reveal opportunities to improve. There are three main packages at different price points and you can get three months free by paying annually, rather than quarterly – so keep that in mind. Of course, you can always sign up to a free trial first, to see how you get on with the platform. Clicktale offers a full suite of analytics tools and its Conversion analytics platform is where you’ll find web forms come into the equation. 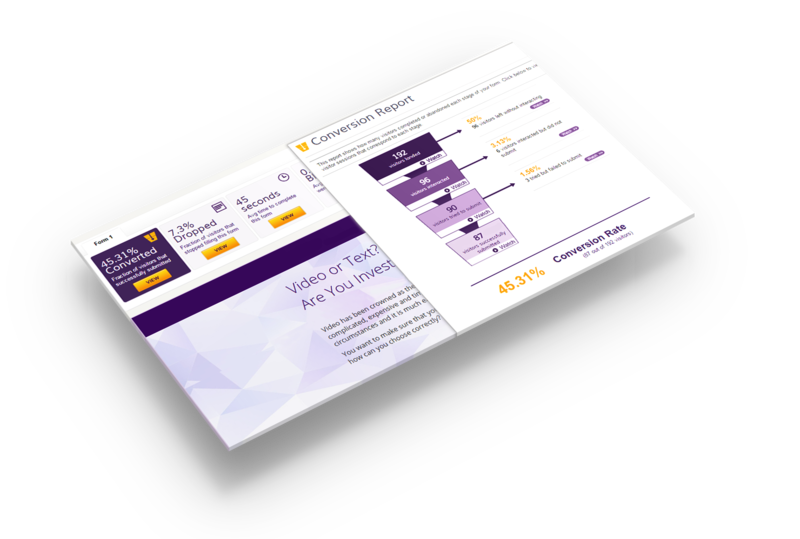 Again, this is a little more than a form analytics tool, providing insights into how effective your conversion funnels are at generating leads and sealing the deal. In most cases, the final stop on these conversion funnels will be one of your forms and this is an integral part of Clicktale’s Conversion analytics tool. The form analytics section tells you how many visitors interact with your form and how many of those failed to successfully complete it. Drop reports show where your forms are being abandoned and you can even replay user sessions to help pinpoint potential problems. You also have time reports, which tell you how long users take to fill out each field and complete the entire form. Then the blank field reports highlight the fields users don’t fill before hitting the submit button, helping you remove unnecessary fields. And, finally, you have refill reports, which flag up fields that users fill incorrectly, thus failing to submit the form. As for pricing, you won’t find any information on the website about packages or fees. 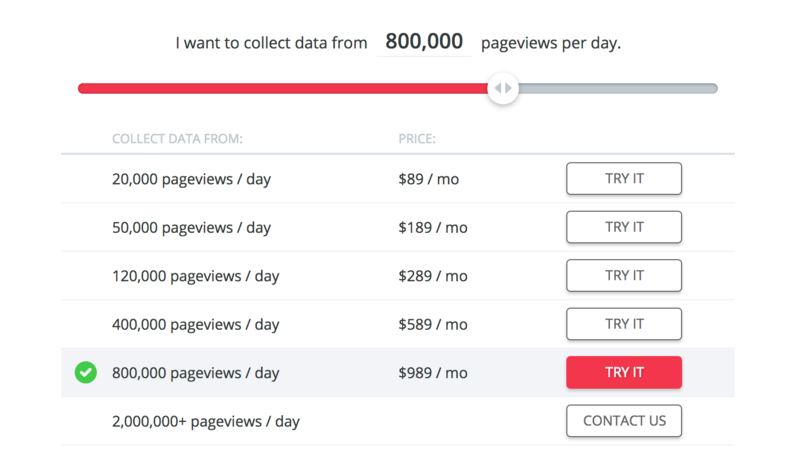 As far as we know, Clicktale still charges by the number of visitors you want to track and prices range from $99 for 20,000 to $990 for 300,000, but we can’t guarantee this is still the case. So Clicktale certainly isn’t the cheapest option for the number of visitors can track for your money. It also doesn’t make much sense to go with Clicktale if you only want form analytics or a few of its tools. However, if you’re looking for a full suite of platforms, Clicktale suddenly becomes a reasonably priced and incredibly useful option. Inspectlet records videos of user sessions in full, so you can see exactly what they get up to on your site. This means you can see every mouse movement, every scroll and each click users make, to better understand why they didn’t convert. 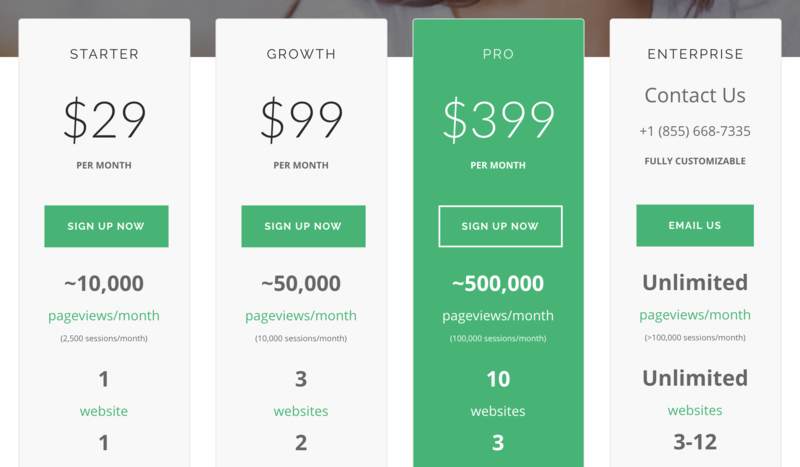 If you sign up to the Growth or Accelerate plans, you also get in-depth form analytics as part of the package. 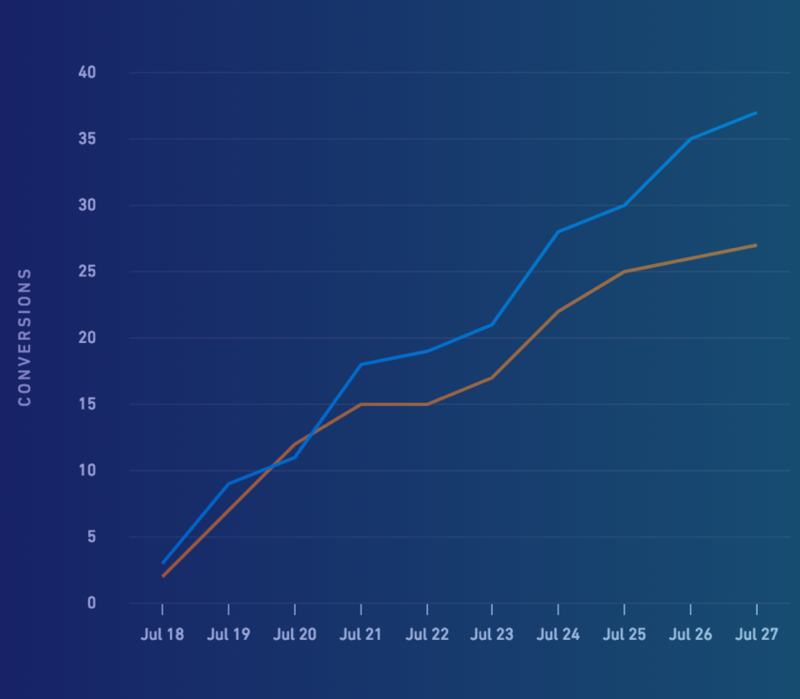 Inspectlet’s Conversion Report gives you the same kind of analytical feedback you can expect from most of the tools we’re looking at today. Once again, you can see how many visitors start using your forms, how many of them convert and how long it takes them to complete fields and forms in full. 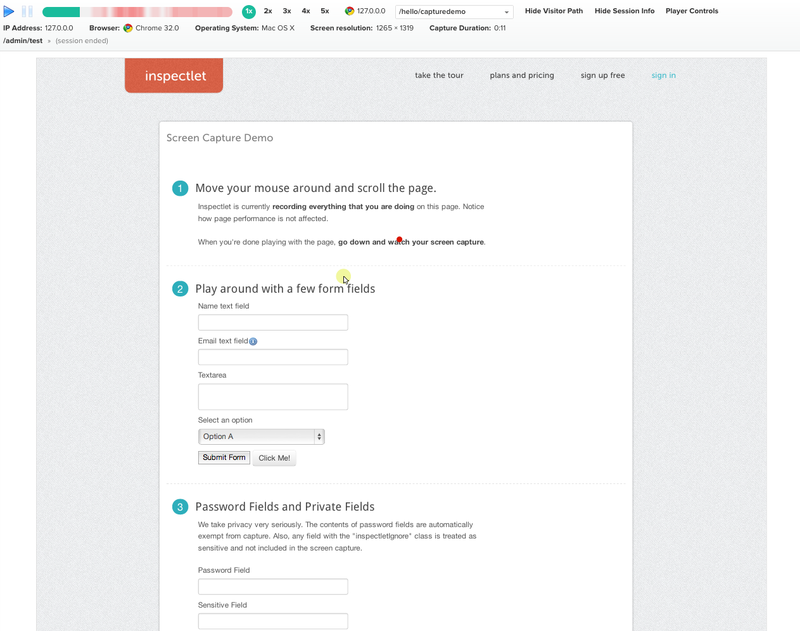 Once again, there’s more to Inspectlet than form analytics, meaning it’s more of a multi-tool than a form specialist. So be sure to check out the other features (session recording and heat mapping) it offers to see how it meets your needs compared to the other platforms we’re suggesting. 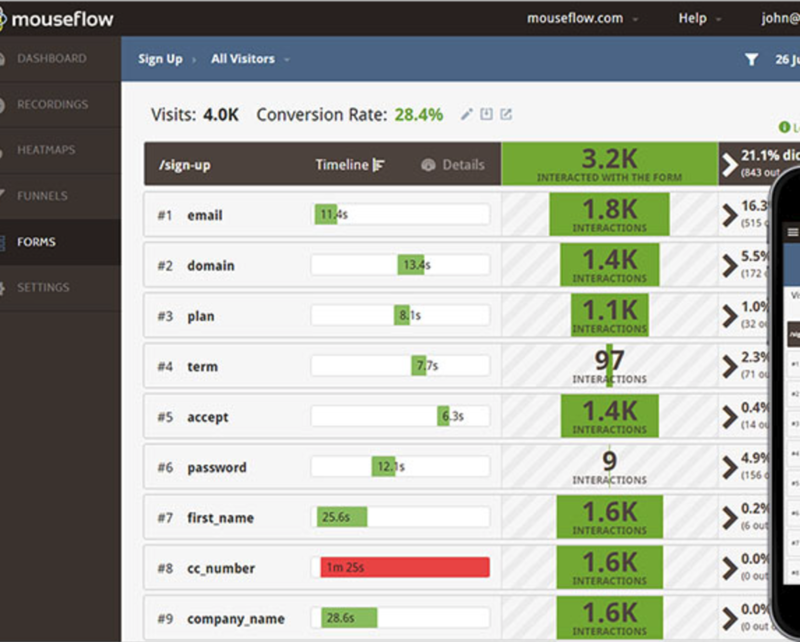 Mouseflow is a lot like Inspectlet in the sense it records user sessions, creates heatmaps and provides form analytics. 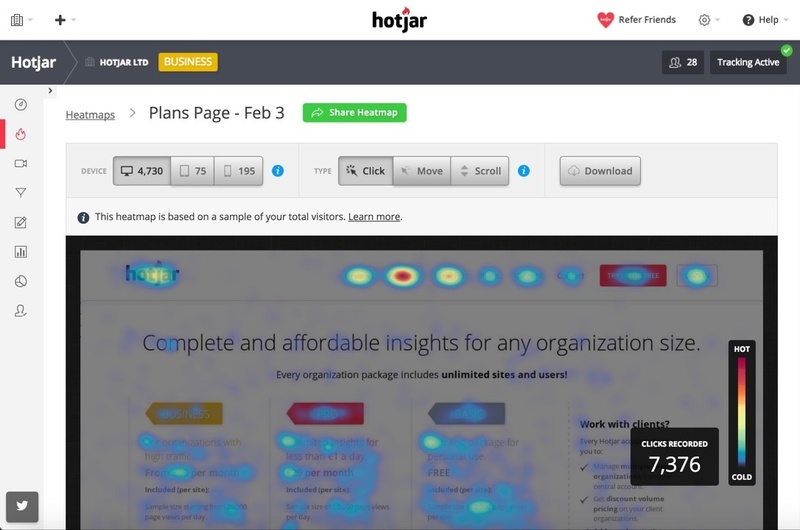 It also packs a few extra features, though, including geo heatmapping to see where your visitors are coming from, click and movement heat maps and reports that show user journeys from page to page. In terms of form analytics, there are no surprises. 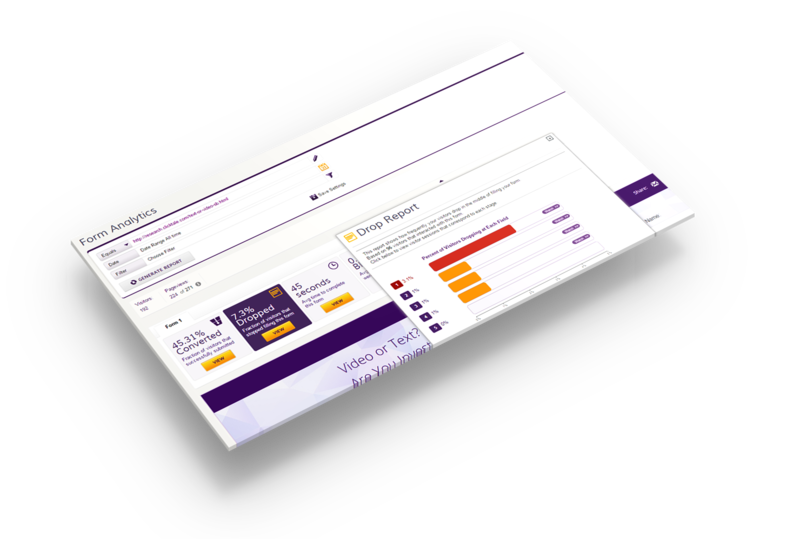 You get info on visitors, form completions, timing, drop-offs and the necessary data to help you spot issues. So, aside from offering a few more features than Inspectlet, the other main difference with Mouseflow is how form analytics fit into the price plans. While you have to pay for one of the more premium plans to get form analytics with Inspectlet, you get this feature with all Mouseflow plans. That said, the number of forms you can get analytics for varies with each plan – starting from one on the most basic plan and increasing from there. That pretty much sums up the main differences between Inspectlet and Mouseflow, so there’s not a great deal between them, depending on your needs. Decibel Insight also offers the whole recorded sessions, heatmaps and form analytics package. However, Decibel Insight goes into a little more detail than both Inspectlet and Mouseflow, which includes the data you’ll collect from your forms. Views: The number of people who viewed your form and how many started filling it out. Abandonment rate: The percentage of users who abandon your form, how many of these users experienced errors. Time taken: The average time it takes users to complete your form, plus average times with and without errors. Error rate: The percentage of users who have errors – single errors, multiple errors and the average number of errors. Completion rate: The percentage of users who complete your form, both with and without errors. As you can see, there’s a big emphasis on the number of errors users have with the idea of helping you remove barriers to successfully completing forms. You also get data on the individual fields on your form, including any delays before users start typing, how long it takes to fill them out, errors rates and abandonment rates. Make no mistake about it, Decibel Insight is a serious platform and it’s priced accordingly from what we can tell (prices on application). We’re told you’ll be looking at a minimum of around $400 per month, which may be a bit much for smaller businesses but this is a full suite of products designed for brands that take conversion optimisation seriously. So those are our top recommendations for web form analytics tools and each of them has something different to offer. There’s no clear winner from our list today; the best tool for you depends on what you need from an analytics tool and most of our recommendations do more than simple data reporting. Your best bet is to take a good look at the features lists of each tool, compare pricing and try out a few free trials to see how your get on. We’re sure you won’t be disappointed!